We Live In A Political World: #351 / Suicide, Anyone? Pictured above is a high-tech "suicide machine," called "the Sarco." That name must have been chosen, I think, as a way to reference the word "sarcophagus," which Wikipedia defines as "a box-like funeral receptacle for a corpse, most commonly carved in stone, and usually displayed above ground, though it may also be buried." Maybe I'm wrong about why the name "Sarco" was chosen, but we know that the bodies of Egyptian royal persons, buried in a sarcophagus, were still around thousands of years later, and when it is time to die, there is a natural human tendency to regret that fact, and to want to continue on, somehow. This machine is probably named to provide a kind of illusion that you might be able to do that, with the only real promise being that the machine will take you out of this life in high-tech style. 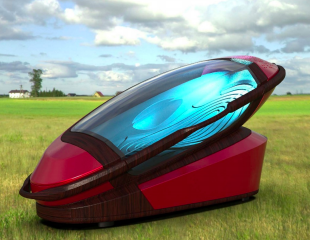 The article in which I read about the Sarco claims that it is "a technological marvel, resembling some kind of futuristic sleeping chamber, that aids in voluntary assisted dying. Australian doctor Philip Nitschke, whom Newsweek identifies as the 'Elon Musk of assisted suicide,' unveiled the new apparatus ... just days after lawmakers in the state of Victoria voted to legalize euthanasia. The device simplifies what Nitschke dubs 'rational suicides,' ensuring that the process is painless and easy—an optimal way to go." I am in general support of the right of individuals to make individual choices about their lives and bodies (and thus about their deaths). Just to be clear, though, I am not likely to be signing up for a visit to a "Sarco Center" when I get to the end of my time on Earth. I continue to believe that the human world that we create, and that we most immediately inhabit, is not the world in which we "ultimately" exist. The World of Nature, the World that God created, for those not offended by religious language, is the world that has brought us so mysteriously into existence (both collectively and as individuals), and that is the world that has the final claim upon us, in my way of thinking about it. Thus, when I die, I am planning to go the "natural route," as humans have done for millennia. If pain comes at the end, I am hoping for palliative care, and I'm hoping, at the point of final pain, and when my end has come, to be able to remember the joys and blessings of such a wonderful, miraculous life.